You are going to have some choices to make at the end this post, which is also, the 4th and final part of this series “James, the Synagogue, and Jesus. You will have to decide whether synagogues are completely evil as some have taught, “some” including some of the ante-Nicene fathers, or whether they also have men in them that are righteous too. Too often, man jumps to conclusions without considering the facts. Are there people in the ekklesia (church) that are hypocrites (pretenders – stage actors) as well? Do they get a pass? Do these hypocrites mean that EVERYONE that goes to church is ALSO a hypocrite (pretender – stage actor)? Prayerfully consider the rest of the entries and let the Ruach HaKodesh (Holy Spirit) guide you as we finish part 4. The Nasi (President) of the Capernaum synagogue. Would a hypocrite (pretender – stage actor) plead and/or beg? If he didn’t have trust would he? Is this just desperation? In Luke is says to fall down before: A leader of the synagogue prostrating himself before Yeshua (Jesus). Does this sound like a hypocrite (pretender – stage actor)?!? In Matthew, is says worshiped (proskuneō) which also means bow down to – show reverence to. He believe (trusts) that if Yeshua will but lay an hand on his “dead” daughter. . .
Luke 11:43 (CJB) 43 “Woe to you P’rushim (Pharisees), because you love the best seat in the synagogues and being greeted deferentially in the marketplaces! A Parush (Pharisee) asks Yeshua to dinner but Yeshua doesn’t do n’tilat yadayim (ceremonial hand washing) – When questioned about it, Yeshua proceeds to tell them what true hypocrisy (pretending – stage acting) really is – he turns the questions back on them. He calls him Rabbi. Is this done in respect or sarcasm? I will leave that up to you to decide. Regardless, Yeshua the Rabbi takes the time to teach. This is a Rabbi teaching both Pharisees and Torah experts where they don’t have right thinking – He is doing what Rabbis do – teaching right thinking and right doing. They had a choice – learn from it or reject it. These particular ones rejected. This doesn’t make the synagogue evil. It is the men IN the synagogue that Yeshua is addressing. The ones that “take the best seats” and “like being shown honor” in public places. Logic tells us there had to be others in the synagogue that they were taking the best seats from, doesn’t it? Why would Yeshua even bring it up if all seated in the synagogue were bad? If you believe that they are all bad, then you have to believe all of the marketplaces were bad too because Yeshua addresses that too. Luke 13:10 (CJB) 10 Yeshua was teaching in one of the synagogues on Shabbat (Sabbath). And just in case you are wondering, this is NOT on Sunday kids. The “Lord’s Day Hypothesis” can’t be applied because it can’t even exist until Yeshua is dead. This is on Saturday – the 7th day – Shabbat. The Savior we all worship, worshiped and taught in synagogues . . . and on Sabbath. If that command is not of any importance, then why did he do it? He didn’t do ceremonial hand washing, why not skip Sabbath as well? Simple – God didn’t ordain ceremonial hand washing at the completion of the 6 days of creation – He did set a day aside then though – He set that day apart and made it Holy at the completion of creation. I can tell you from personal experience, that you will only see this and understand this if you take off your prescribed “theological” glasses and look at the text as naked before God as King David did when he danced. John 6:59 (CJB) 59 He said these things as he was teaching in a synagogue in K’far-Nachum (Capernaum). 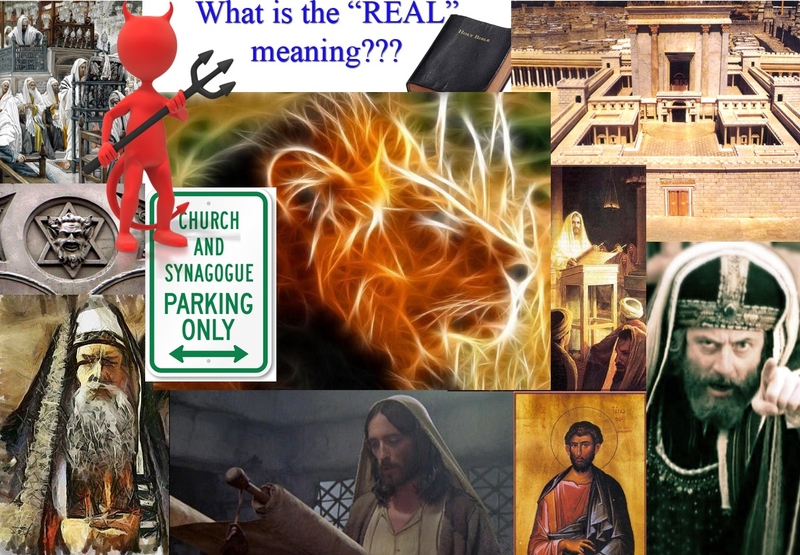 John 6:60-61 (CJB) 60 On hearing it, many of his talmidim said, “This is a hard word—who can bear to listen to it?” 61 But Yeshua, aware that his talmidim were grumbling about this, said to them, “This is a trap for you? John 6:66 (CJB) 66 From this time on, many of his talmidim turned back and no longer traveled around with him. I think associating these verses with that number you will remember these verses from now on, don’t you? Kind of a Mnemonic aid to help you remember the text here. “I have ALWAYS . . .” (not in private or coerced) Temple or synagogue – public. Acts 6:10 (CJB) 10 but they could not stand up against his wisdom or the Spirit by which he spoke. Acts 9:2 (CJB) 2 and asked him for letters to the synagogues in Dammesek (Damascus), authorizing him to arrest any people he might find, whether men or women, who belonged to “the Way,” and bring them back to Yerushalayim (Jerusalem). Enter Sha’ul (Paul) . . . angry! Going straight to the cohen hagadol (high priest) for letters to the synagogues in Dammesek (Damascus). Acts 9:20 (CJB) 20 and immediately he began proclaiming in the synagogues that Yeshua (Jesus) is the Son of God. Sha’ul has a change of heart . . .
Yochanan (Mark). The name Mark is not in the text but is known from 12:25. Acts 12:25 (CJB) 25 Bar-Nabba and Sha’ul, having completed their errand, returned from Yerushalayim, bringing with them Yochanan, surnamed Mark. David H. Stern, Jewish New Testament Commentary, (Clarksville, Maryland: Jewish New Testament Publications, Inc., 1992), WORDsearch CROSS e-book, 267. Thoralf Gilbrant, ed., “3111. Μάρκος,” in The Complete Biblical Library Greek-English Dictionary – Lambda-Omicron, (Springfield, MO: Complete Biblical Library, 1991), WORDsearch CROSS e-book, Under: “3111. Îœá½±ÏÎºÎ¿Ï‚”. Acts 13:5 (NIV) 5 When they arrived at Salamis, they proclaimed the word of God in the Jewish synagogues. John was with them as their helper. Acts 13:5 (HCSB) 5 Arriving in Salamis, they proclaimed God’s message in the Jewish synagogues. They also had John as their assistant. Acts 13:5 (NKJV) 5 And when they arrived in Salamis, they preached the word of God in the synagogues of the Jews. They also had John as their assistant. Acts 13:5 (KJV) 5 And when they were at Salamis, they preached the word of God in the synagogues of the Jews: and they had also John to their minister. Acts 13:5 (NASB) 5 When they reached Salamis, they began to proclaim the word of God in the synagogues of the Jews; and they also had John as their helper. You have heard me say it before, this is just one of the reasons I use the CJB (Complete Jewish Bible) translation of the text. Acts 13:14 (CJB) 14 but the others went on from Perga to Pisidian Antioch, and on Shabbat (Sabbath) they went into the synagogue and sat down. Sha’ul still observing Shabbat (Sabbath) AFTER becoming a follower of Yeshua. Since Sha’ul was born 2 years after Yeshua died, was he clueless? Uniformed? Do you read his epistles (letters) and and hang on every word, while at the same time, dismissing that he kept Shabbat many years after Yeshua’s Crucifixion? Why is that exactly? Let me put it another way by asking a simple question, “Which Authority: Tradition or Text? Acts 13:42 (CJB) 42 As they left, the people invited Sha’ul (Paul) and Bar-Nabba (Barnabas) to tell them more about these matters the following Shabbat. Notice the following: the people invited … tell them more … the following Shabbat. Acts 13:42 (CJB) 42 As they left, the people invited Sha’ul and Bar-Nabba to tell them more about these matters the following Shabbat. Acts 13:42 (NIV) 42 As Paul and Barnabas were leaving the synagogue, the people invited them to speak further about these things on the next Sabbath. Acts 13:42 (HCSB) 42 As they were leaving, the people begged that these matters be presented to them the following Sabbath. Acts 13:42 (NKJV) 42 So when the Jews went out of the synagogue, the Gentiles begged that these words might be preached to them the next Sabbath. Acts 13:42 (KJV) 42 And when the Jews were gone out of the synagogue, the Gentiles besought that these words might be preached to them the next sabbath. Acts 13:42 (NASB) 42 As Paul and Barnabas were going out, the people kept begging that these things might be spoken to them the next Sabbath. **It is ironic in that the NASB is considered to be a “literal” type translation in that it inserts the words “Paul and Barnabas” which aren’t in the Greek. Even though it is obvious who the text is talking about, these are inserted words none the less. Acts 13:43 (CJB) 43 When the synagogue meeting broke up, many of the born Jews and devout proselytes followed Sha’ul (Paul) and Bar-Nabba (Barnabas), who spoke with them and urged them to keep holding fast to the love and kindness of God. Are these “born Jews” and “devout proselytes” that follow and Barnabas and Paul hypocrites (pretenders – stage actors)? Acts 14:1 (CJB) 1 In Iconium the same thing happened — they went into the synagogue and spoke in such a way that a large number of both Jews and Greeks came to trust. How about the “ large number of both Jews and Greeks (Hellenists) came to trust?” Are these hypocrites (pretenders – stage actors)? A native of Greece, used of Timothy’s father (Acts 16:1); every New Testament occurrence could be seen as referring to Gentiles, as opposed to Jews (Romans 1:14,16). Thoralf Gilbrant, ed., “1659. Ἕλλην,” in The Complete Biblical Library Greek-English Dictionary – Delta-Epsilon, (Springfield, MO: Complete Biblical Library, 1991), WORDsearch CROSS e-book, Under: “1659. á¼Î»Î»Î·Î½”. If you believe everyone in the synagogue is a hypocrite (pretender – stage actor), then do you also believe that these Gentiles believers in this synagogue are also hypocrites? Whether you answer “yes” or “no,” each answer has problems if you believe ALL synagogues are evil or that ALL in the synagogues are hypocrites. Now we have the Jeruslem Council with Ya’akov (which you learned in part 3 was Jacob but is translated as James), the half brother of Yeshua, talking about synagogues. Another simple question, How does he refer to synagogues? Acts 17:1 (CJB) 1 After passing through Amphipolis and Apollonia, Sha’ul and Sila came to Thessalonica, where there was a synagogue. Acts 17:10 (CJB) 10 But as soon as night fell, the brothers sent Sha’ul (Paul) and Sila (Silas) off to Berea. As soon as they arrived, they went to the synagogue (of the Jews). Acts 17:11-12 (CJB) 11 Now the people here were of nobler character than the ones in Thessalonica; they eagerly welcomed the message, checking the Tanakh every day to see if the things Sha’ul was saying were true. 12 Many of them came to trust, as did a number of prominent Greek women and not a few Greek men. They (The Bereans) checked the Tanakh (Old Testament) which was the only Bible at the time (The New Testament had NOT been written yet), to see if what Sha’ul (Paul) said was true . . .THEN they came to trust. I use this same principle in my writings – it is why I give you the text instead of just a verse number – I WANT you to CHECK before you ACCEPT! So another question: Synagogue “of the Jews.” Were their other kinds of synagogues? Kind of a trick question? What is a synagogue in the biblical text? The same thing an ekklesia (church) is: an assembly or congregation of . . . In other words, you could have an “ekklesia” or a “synagogue” of bargain hunters on Black Friday waiting to get in and get the good deals – You could have a “assembly” of bargain hunters . . .
Acts 17:17 (CJB) 17 So he began holding discussions in the synagogue with the Jews and the “God-fearers (God-fearing Gentiles),” and in the market square every day with the people who happened to be there. Acts 17:16 (CJB) 16 While Sha’ul was waiting for them in Athens, his spirit within him was disturbed at the sight of the city full of idols. Acts 17:22-23 (CJB) 22 Sha’ul stood up in the Council meeting and said, “Men of Athens: I see how very religious you are in every way! 23 For as I was walking around, looking at your shrines, I even found an altar which had been inscribed, ‘To An Unknown God.’ So, the one whom you are already worshiping in ignorance — this is the one I proclaim to you. This is NOT irony – this is evangelism! This is evangelism by someone that not only knows the text, but know the beliefs of the people he is evangelizing! Sha’ul is not an apologist, he is a polemicist! Acts 18:4 (CJB) 4 Sha’ul also began carrying on discussions every Shabbat (Sabbath) in the synagogue, where he tried to convince both Jews and Greeks. Nation, people, heathen, pagans, Gentiles. Thoralf Gilbrant, ed., “1477. ἔθνος,” in The Complete Biblical Library Greek-English Dictionary – Delta-Epsilon, (Springfield, MO: Complete Biblical Library, 1991), WORDsearch CROSS e-book, Under: “1477. á¼”Î¸Î½Î¿Ï‚”. 3 that I could wish myself actually under God’s curse and separated from the Messiah, if it would help my brothers, my own flesh and blood, 4 the people of Isra’el! They were made God’s children, the Sh’khinah (glory) has been with them, the covenants are theirs, likewise the giving of the Torah, the Temple service and the promises; 5 the Patriarchs are theirs; and from them, as far as his physical descent is concerned, came the Messiah, who is over all. Praised be Adonai for ever! Amen. Does this seem like a Sha’ul that would abandon in what HE terms; (in a grief so great and a pain in the heart so constant) his fellow Jews?!? Does he no longer wish himself under the curse and separated from Messiah if it could help his fellow Jews? I am going to be blunt – if you believe that the Sha’ul above in Romans all of a sudden had a change of heart and no longer agonizes or hurts for his fellow Jews, you are reading something into the text that simply is NOT there! “I have done what I could to bring you the message of salvation; you choose to reject it at your peril, but I have discharged my responsibility. I would not leave you and go to the Goyim (13:46&N) if you were responsive, but you leave me no other choice. The Gospel is for you especially, but it will also save them” (Ro 1:16). David H. Stern, Jewish New Testament Commentary, (Clarksville, Maryland: Jewish New Testament Publications, Inc., 1992), WORDsearch CROSS e-book, 289. Acts 18:7 (CJB) 7 So he left them and went into the home of a “God-fearer (God-fearing Gentile)” named Titius Justus, whose house was right next door to the synagogue. Again, God was already working. Just as God saw to it that Aquila and Priscilla were in Corinth in time to provide Paul a home and a place to work, so God had a Godfearing Gentile living right next door to the synagogue who was ready to open his house as a new evangelistic center. His name was Titus (or Titius) Justus. His Roman name indicates he was a Roman citizen. Sir William Ramsay and others have suggested his full name was Gaius Titius Justus and that he was the Gaius mentioned in Romans 16:23 and 1 Corinthians 1:14. Thoralf Gilbrant, ed., The Complete Biblical Library – Acts, (Springfield, IL: World Library Press, Inc., 1988), WORDsearch CROSS e-book, 433. Acts 18:19 (CJB) 19 They came to Ephesus, and he left them there; but he himself went into the synagogue and held dialogue with the Jews. Acts 18:26 (CJB) 26 He began to speak out boldly in the synagogue; but when Priscilla and Aquila heard him, they took him aside and explained to him the Way of God in fuller detail (more accurately). Acts 18:24 (CJB) 24 Meanwhile, a Jewish man named Apollos, a native of Alexandria, came to Ephesus. He was an eloquent speaker with a thorough knowledge of the Tanakh. A Christian from Alexandria who taught at Ephesus (Acts 18:24) and Corinth (Acts 19:1). Thoralf Gilbrant, ed., “619. Ἀπολλώς,” in The Complete Biblical Library Greek-English Dictionary – Alpha-Gamma, (Springfield, MO: Complete Biblical Library, 1991), WORDsearch CROSS e-book, Under: “619. á¼ˆÏ€Î¿Î»Î»á½½Ï‚”. 2 conclusions: Apollos is no longer a Jew and has converted to “Christianity” even though the text calls him specifically a Jew here OR Christian is nothing more than a term used to differentiate the sect in Judaism of the time that follows Yeshua (Jesus) as the promised Messiah. Pharisees had certain beliefs, Sadducees had certain beliefs and now, Christians can be added to that mix as well. The theology you subscribe to will probably affect your understanding of the text here one way or the other. Acts 19:8 (CJB) 8 Sha’ul went into the synagogue; and for three months he spoke out boldly, engaging in dialogue and trying to persuade people about the Kingdom of God. Acts 19:9 (CJB) 9 But some began hardening themselves and refusing to listen; and when these started defaming the Way before the whole synagogue, Sha’ul withdrew, took the talmidim with him, and commenced holding daily dialogues in Tyrannus’s yeshivah. Acts 24:12 (CJB) 12 and neither in the Temple nor in the synagogues nor anywhere else in the city did they find me either arguing with anyone or collecting a crowd. Acts 26:11 (CJB) 11 Often I went from one synagogue to another, punishing them and trying to make them blaspheme; and in my wild fury against them, I even went so far as to persecute them in cities outside the country. James 2:2 (CJB) 2 Suppose a man comes into your synagogue wearing gold rings and fancy clothes, and also a poor man comes in dressed in rags. James 2:2 (NIV) 2 Suppose a man comes into your meeting wearing a gold ring and fine clothes, and a poor man in shabby clothes also comes in. James 2:2 (HCSB) 2 For example, a man comes into your meeting wearing a gold ring and dressed in fine clothes, and a poor man dressed in dirty clothes also comes in. Verse 2. For if there come unto your assembly. Marg., as in Gr., synagogue. It is remarkable that this is the only place in the New Testament where the word synagogue is applied to the Christian church. It is probably employed here because the apostle was writing to those who had been Jews; and it is to be presumed that the word synagogue would be naturally used by the early converts from Judaism to designate a Christian place of worship, or a Christian congregation, and it was probably so employed until it was superseded by a word which the Gentile converts would be more likely to employ and which would, in fact, be better and more expressive-the word church. The word synagogue (συναγωγην) would properly refer to the whole congregation, considered as assembled together, without respect to the question whether all were truly pious or not; the word church (εκκλησια) would refer to the assembly convened for worship as called out, referring to the fact that they were called out from the world, and convened as worshippers of God, and would, therefore, be more applicable to a body of spiritual worshippers. A man with, a gold ring. Indicative of rank or property. Rings were common ornaments of the rich; and probably then, as now, of those who desired to be esteemed to be rich. For proof that they were commonly worn, see the quotations in Wetstein, in loc. In goodly apparel. Rich and splendid dress. Compare Luke 16:19. A poor man in vile raiment. The Greek here is, filthy, foul; the meaning of the passage is, in sordid, shabby clothes. The reference here seems to be, not to those who commonly attended on public worship, or who were members of the church, but to those who might accidentally drop in to witness the services of Christians. See 1 Corinthians 14:24. Albert Barnes, Notes on the New Testament Explanatory and Practical, ed. Robert Frew WORDsearch CROSS e-book, Under: “James 2”. James 5:14 (CJB) 14 Is someone among you ill? He should call for the elders of the congregation. They will pray for him and rub olive oil on him in the name of the Lord. Thoralf Gilbrant, ed., “1564. ἐκκλησία,” in The Complete Biblical Library Greek-English Dictionary – Delta-Epsilon, (Springfield, MO: Complete Biblical Library, 1991), WORDsearch CROSS e-book, Under: “1564. á¼ÎºÎºÎ»Î·Ïƒá½·Î±”. Place of assembly, synagogue, a congregation. James 5:14 (NIV) 14 Is any one of you sick? He should call the elders of the church to pray over him and anoint him with oil in the name of the Lord. James 5:14 (HCSB) 14 Is anyone among you sick? He should call for the elders of the church, and they should pray over him after anointing him with olive oil in the name of the Lord. James 5:14 (NKJV) 14 Is anyone among you sick? Let him call for the elders of the church, and let them pray over him, anointing him with oil in the name of the Lord. This reflects the translators’ unwillingness to acknowledge the Jewishness of New Covenant faith and the overall antisemitic bias that has infected Christianity over the centuries (see Ro 10:4&N). The New Jerusalem Bible prepared by Roman Catholics does use the word “synagogue,” but adds in a note, “James is writing to Jewish Christians; it is possible that they may even have still been attending Jewish synagogues, or it may be his word for the Christian ‘assembly’ for liturgical services.” “Even… still… attending Jewish synagogues”—how backward of them! And how backward of Shaʾul, who made it his “usual practice” to do so (Ac 17:2)! Yaʿakov is talking neither about a Christian church service nor a gathering of Jewish nonbelievers but a Messianic synagogue. He would not refer to “your synagogue” and assume his readers were in charge of seating visitors if the synagogue was not controlled by the Messianic Jews. There is no reason why “synagogue,” with its unmistakably Jewish connotation, should have been “his word for the Christian ‘assembly'” in general, since the term the New Testament uses 112 times for that is “ekklêsia” (usually rendered “church” in other versions; see Mt 16:18N); Yaʿakov himself employs it at 5:14. The idea that this synagogue was Messianic simply did not occur to the Jerusalem Bible note-writer. Rendering sunagôgê “assembly” or “church” instead of “synagogue” robs Messianic Jews of their identity. This verse establishes a solid New Testament basis for modern-day Messianic synagogues, provided they do not exclude Gentile believers. To do so would “raise the middle wall of partition” once again, in violation of Ep 2:11-16&NN. A Messianic synagogue, while committed to preserving and developing a Jewish rather than a Gentile mode of expressing New Covenant faith, must be open to participation by believing Jews and Gentiles alike. David H. Stern, Jewish New Testament Commentary, (Clarksville, Maryland: Jewish New Testament Publications, Inc., 1992), WORDsearch CROSS e-book, 728-729. All one has to do is read ACTS 15 in context to verify that the congregation that Ya’akov is a part of is a Jewish congregation. When one considers what David Stern wrote above in the context of what is happening in Acts 15, it is very hard to ignore the Jewish context and makeup of the congregation in Jerusalem – his explanation has much merit. James 1:1 (CJB) 1 From: Ya‘akov, a slave of God and of the Lord Yeshua the Messiah To: The Twelve Tribes in the Diaspora: Shalom! To: The 12 Tribes in the Diaspora which are not meeting in synagogues but in Christian churches. . .
Psalm 34:11-14 (CJB) 11 Come, children, listen to me; I will teach you the fear of Adonai. 12 Which of you takes pleasure in living? Who wants a long life to see good things? 13 [If you do,] keep your tongue (Lashon) from evil (Ra) and your lips from deceiving talk; 14 turn from evil, and do good; seek peace, go after it! James 2:8 (CJB) 8 If you truly attain the goal of Kingdom Torah, in conformity with the passage that says, “Love your neighbor as yourself,” you are doing well. James 4:11 (CJB) 11 Brothers, stop speaking against each other! Whoever speaks against a brother or judges a brother is speaking against Torah and judging Torah. And if you judge Torah, you are not a doer of what Torah says, but a judge. Revelation 2:9 (CJB) 9 “I know how you are suffering and how poor you are (though in fact you are rich! ), and I know the insults of those who call themselves Jews but aren’t — on the contrary, they are a synagogue of the Adversary. The Synagogue of Satan! This is the verse where most people seem to get their synagogue is evil stance. Question is, who is this addressing? ALL synagogues? Like the synagogues where Yeshua and Sha’ul taught? The synagogue in Berea? The synagogue in Jerusalem where Yeshua’s half brother Ya’akov presides? … in calling them a “synagogue of Satan,” his rhetoric resembles that of the Dead Sea Scrolls, where a persecuted Jewish sect that considered the rest of Judaism apostate called its opponents “the lot of Belial” (Satan). Craig S. Keener, The IVP Bible Background Commentary – New Testament, (Downers Grove, IL: InterVarsity Press, 1993), WORDsearch CROSS e-book, Under: “Revelation 2:8-11 Oracle to the Church at Smyrna”. Revelation 3:9 (CJB) 9 Here, I will give you some from the synagogue of the Adversary, those who call themselves Jews but aren’t — on the contrary, they are lying — see, I will cause them to come and prostrate themselves at your feet, and they will know that I have loved you. David H. Stern, Jewish New Testament Commentary, (Clarksville, Maryland: Jewish New Testament Publications, Inc., 1992), WORDsearch CROSS e-book, 799. Deuteronomy 32:21 (CJB) 21 They aroused my jealousy with a non-god and provoked me with their vanities; I will arouse their jealousy with a non-people and provoke them with a vile nation. Long study – long series – long post, huh? I could have broke this one down into 2 separate posts, but I think it needed the context of verses such as the Bereans in Acts 17:10 to be available in the same post in case some only read part 4 of this series. I hope this caused you to open up your bibles and consider what is being said in context. I hope you got something out of this that you didn’t know before. I hope and pray it has been helpful in you seeing Jew and Gentile together as one new humanity. Whether it is as a synagogue or a ekklesia (because both are “assemblies”) what will matter is that they are “assemblies of believers” regardless of whether they are Jewish or Gentile – synagogue or church. This entry was posted in Word Studies and tagged Apollos, apologist, assembly, ἐκκλησία, ἔθνος, Ἕλλην, Berea, Capernaum, ceremonial hand washing, Christians, CJB, Complete Jewish Bible, congregation, Deuteronomy 32:21, eiōtha, ekklesia, ethnos, evangelism, God-fearer, Goyim, Greeks, Ha'azinu, Hellenists, Hellēn, hypocrisy, hypocrite, συναγωγή, Jacob, james, Jesus, jews, John 6:66, K’far-Nachum, Lashon, martyr, Mnemonic aid, Moses, Moshe, n'tilat yadayim, paul, P’rushim, Pharisees, Polemic, polemicist, ra, rabbi, Romans 9:1, Sabbath, Sha"ul, shabbat, sunagōgē, Synagogue, synagogue of Satan, Tanakh, The 12 Tribes in the Diaspora, The Bereans, torah, Ya'akov, Yeshua, Your blood be on your own heads. Bookmark the permalink. Your indepth study of the word is incredible! You are right these are very long but mostly due to reference, not opinion. And as for synagogues being evil… what did Jesus say? “…the rocks would cry out!” Clearly making the case that everything is God’s and if men stopped praising Him, the walls of synagogues are made of rock… flesh is rebellious towards God, what we make can be used for good or evil but the evil is clearly in the hearts of men. Thanks for the encouragement Kev!